Kairavini karaiyinile - திரு அல்லிக்கேணி குளக்கரையோரம்: Thiruvallikkeni Sri Varadharajar Garuda Sevai & .. " Doddachaar Sevai"
Thiruvallikkeni Sri Varadharajar Garuda Sevai & .. " Doddachaar Sevai"
As our Swami observed, even in Kali Yuga – Perumal had direct interaction with Thirukachi Nambigal and our Doddacharyar Swami. Garuda Seva has special significance not only for Kanchi, more so for Sholinghur because of Swami Doddachaaryar connection. Forefather of the present day Acharyar, who lived during 16th century, was an ardent devotee of Lord Varadharaja and did many kainkaryams to Him. 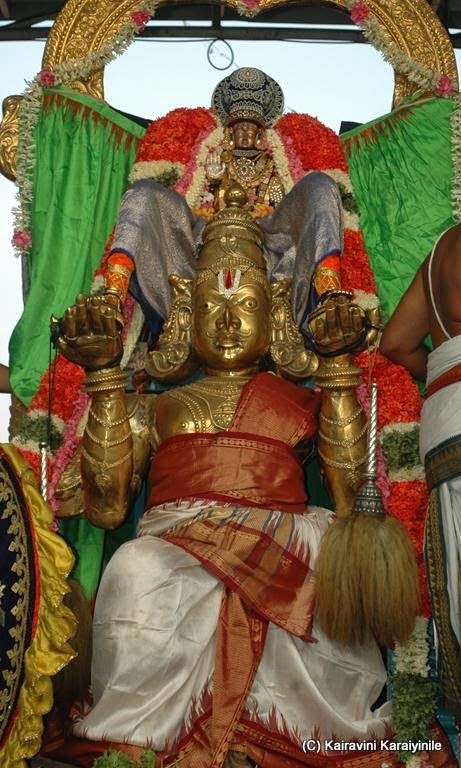 He was a regular in the annual Vaikasi Garuda Sevai of Devathirajar. Legend has it that on a particular year, he was not well and could not attend the Garudothsavam at Kachi. He was feeling desperate about his misfortune of not being able to have darshan of PerArulalar at Kachi on Garuda vahanam. He lamented standing near the Thakkan kulam at Cholasimhapuram (Sholinghur]. He composed hymns on Varadharaja, known as Sri Devaraja Panchakam. He longed for the Lord's sevai and these outpourings were a direct result. Emperuman will never let his ardent bhaktha down. He came down to Sholinghur and gave darshan to Doddacharyar - seated on Garuda vahanam. Such is the mercy and leela vinotham of PerArulalar. 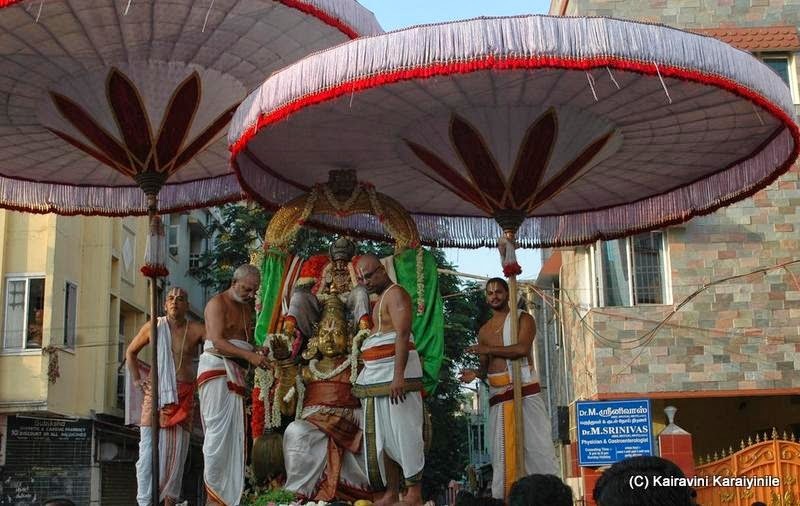 Even today, on Vaikasi Garudothsavam day, there is a tradition known as Doddachaaryar Sevai, when the archakas hide Lord Varadar at the western gate for a short time with two umbrellas just before He leaves the temple. It is believed that Lord goes to Sholinghur for giving darshan to Doddacharyar. 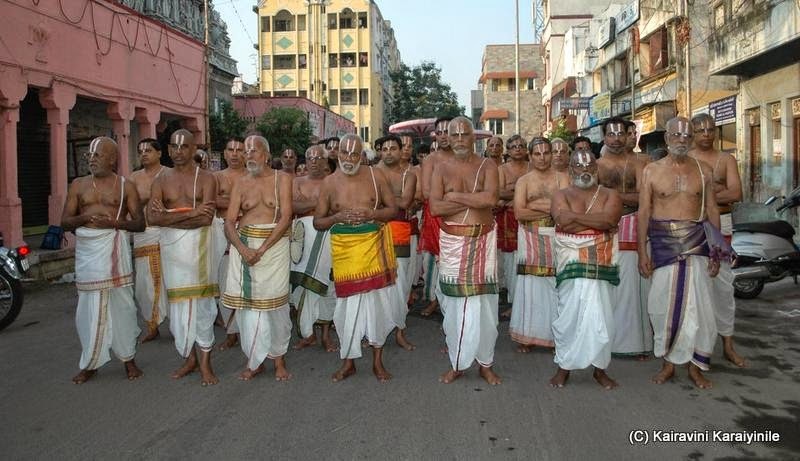 The mangala harathi takes place thereafter. In the Devaraja Panchakam, Acharyan [Doddachaaryar] sings that .’Lord Varadarajan is radiant on the back of Garudan --the son of Vinathai—and is flanked on both sides by the twin sets of white umbrellas and Kavari deer tail chamarams (fans). His sacred, lotus-soft right hand is held in abhaya mudhra pose assuring all that He will free them from all their fears. His beautiful lotus-like eyes rain anugraham on all the beholders. 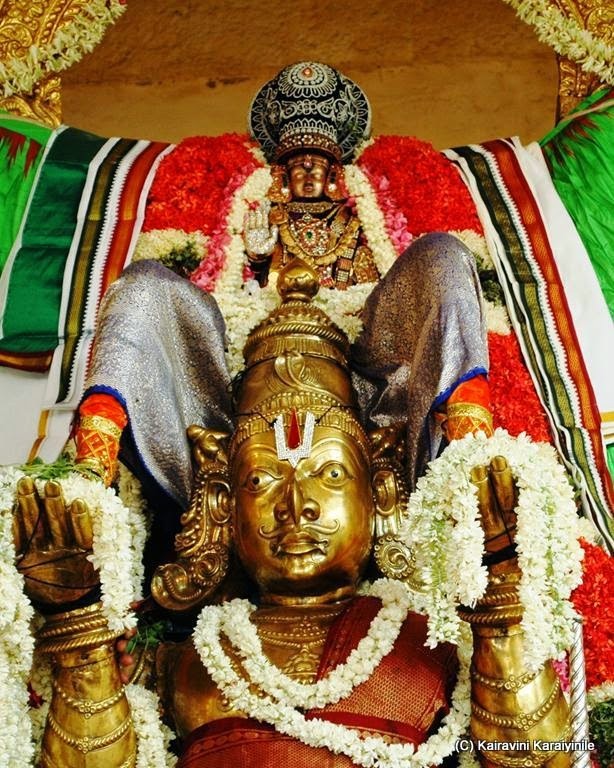 Adiyen salutes always that Sarva Mangala Moorthy emerging out of His aasthaanam through the western gopuram on the third day of His Vaikasi Brahmothsavam. 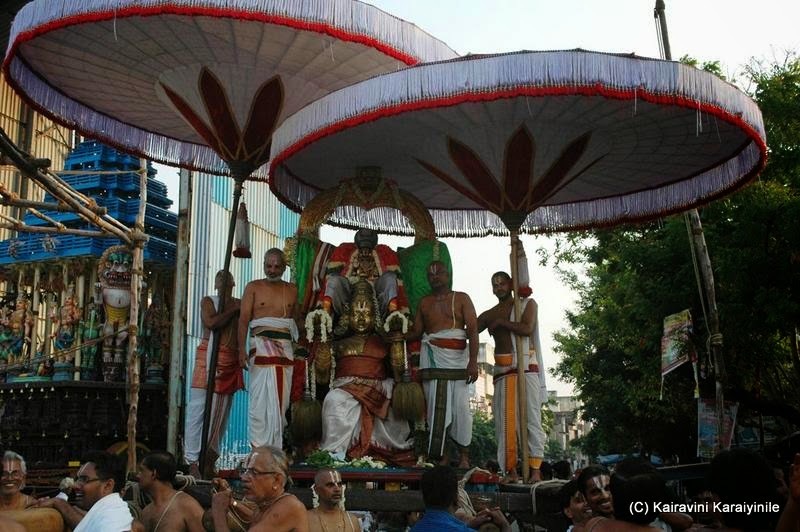 Here are some photos taken this morning during the purappadu at Thiruvallikkeni. Sri Parthasarathi Swami Ekadasi Purappadu.